First of all, did you know that Washington is the #1 producer of PB&J Concord grapes? Also, Washington ranks second only to California in the production of wine grapes. That would be Eastern Washington. Up until the recent climate change we had a “slim to none” chance of growing consistently acceptable grapes here in the South Sound. We did not have enough GDD (Growing Degree-days). Basically that means an accumulation of heat, something Eastern Washington has in spades. Now we have a better chance of growing both table and wine grapes. Many local nurseries carry grape vines now. The most readily available table grapes vines are Black Monukka, Canadice (spicy red), Flame Seedless (large and sweet), Suffolk Red (soft and sweet), Himrod (white) and good old Concord. 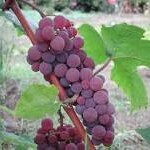 Wine grapes with a good chance of ripening are Siegerrebe (German white), Pinot Noir Precoce (earlier than Pinot Noir) and Garanoir (Swiss red). 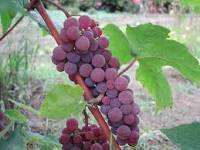 If you have enough faith in South Sound weather to expect ripe tomatoes then why not try a grape or two? Look at it this way… if we have a cooler than normal summer and the grapes are a “fail” you still have all those grape vines to make wreaths. One of the few kinds of gardening that is completely under your control (weather excepted) is when you garden in containers. Container gardening is ideal when you buy a rare, unusual, tiny or expensive plant. Most plants survive in containers for a long, long time…think bonsai. The advantages to gardening in containers (from expensive pots to buckets with holes in the bottom) far outweigh the negatives. Clay or terracotta pots are porous and allow air and moisture to penetrate them. Plastic or metal pots are non porous and nothing gets through the sides…no “breathing”. This isn’t a big deal unless you really like to water. Terracotta is better if you are a habitual over-waterer (you know who you are). A great way to learn about a new plant is to grow it in a container. Since many of the more unusual (read spendy) plants come in fairly small 4” to 6” size pots, it’s a good idea to put them in a container garden just to keep an eye on them…see what they do before you find a permanent place. You can move the containers around to experiment with more sun or shade and find out exactly what the plant likes. Containers are like furniture…move them around and create a whole new look. Some good rules of mixed container gardening…don’t overcrowd, choose plants with different textures (shiny, dull, light reflecting, light absorbing), at least one plant with some architectural interest (like phormium, dracaena) and plants with both large and small leaves. 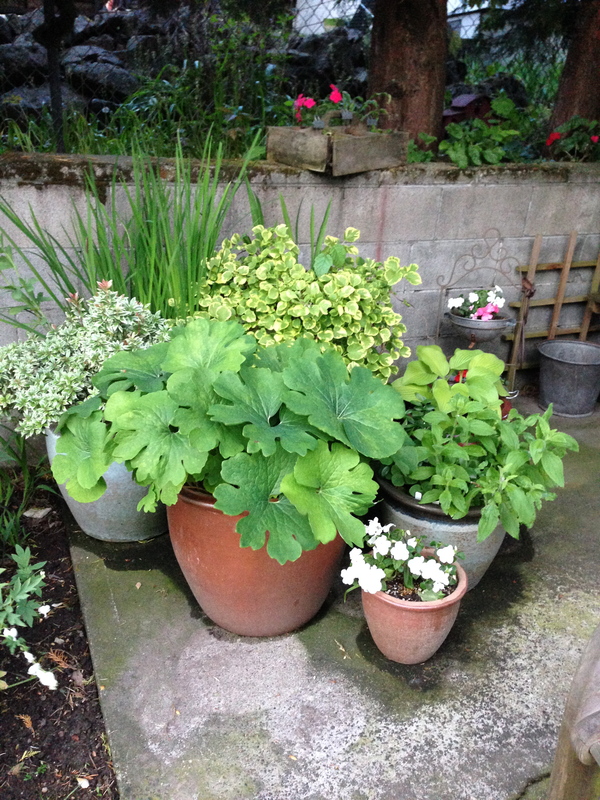 Container gardening is not overwhelming. It almost seems like an obligation to read the new Jane Goodall book, “Seeds of Hope”. This is her first botany book and the first time she shares her love and interest in plants. Living with Chimpanzees in Gombe, Africa, for more than 50 years has given her a unique perspective on the importance of a plant diverse planet. She gives own her perspective without being too preachy or political. Her prose makes her science palatable. You won’t find many statistics but you will find plenty of anecdotes about her childhood brush with gardens and her continued interest in the roll of plants in our world.